On The Air This Week, We're Exploring Digital Childhood : All Tech Considered From infants to almost independent teens — technology is transforming how kids grow up and how parents raise them. This week, we are going on a ride through a digital childhood. Send us your questions and thoughts. This week, we'll explore the touch-screen generation. As much as we can, we will craft our tech and culture coverage around a certain theme each week, meaning each of us will report one story as part of the theme and you'll hear those stories on our flagship shows. At the conclusion of each week, they'll get mashed into a whimsical podcast you can download. For our first attempt at a theme week, we chose "raising digital natives," or, more simply, technology and our kids. It's especially good timing — the American Academy of Pediatrics this morning released new guidelines on whether parents should allow screen time, updating previous rules for the touch screen generation. 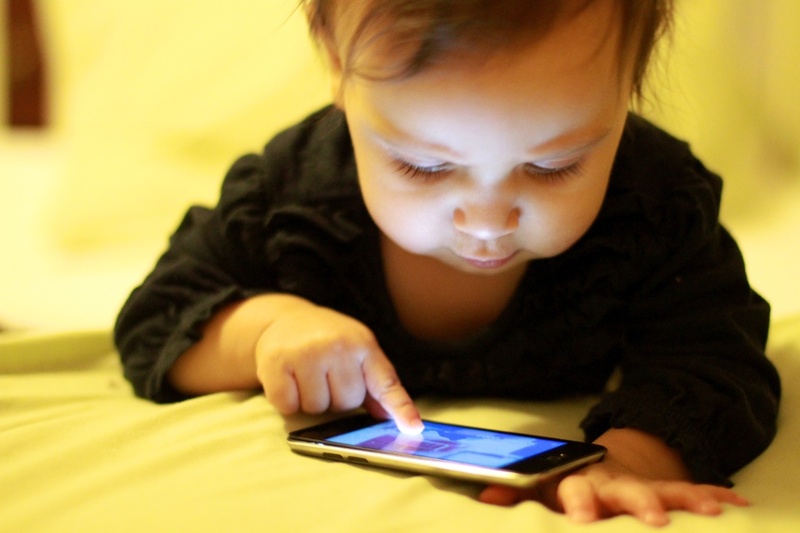 And the nonprofit Common Sense Media is out with new numbers showing that among children under age 2, 38 percent had used mobile devices like iPhones and tablets. For children 8 and under, the average amount of time they spend using mobile devices has tripled since a similar survey two years ago. Louis C.K. 's rant against kids and cellphones. What struck us was how well Louis C.K. expressed his fears about what all this technology was doing to his kids. So many of us are trying to help kids navigate this stuff. So this week, we want to have a conversation with you through our stories on the air and here on the blog. If you're a parent or a kid, or a friend of a parent or a kid or were a kid once — we are going on a ride through a digital childhood. On the air, I'll be reporting on babies and screen time — how early is too early? Steve Henn will explore the complex design thinking behind your kid's favorite video games, and Laura Sydell takes a closer look at ask.fm, which critics fear is making it easier for teens to be bullied online. But we want to hear from you: What's your approach to technology and your children? What do you want to learn more about when it comes to the way children and teens are coming of age in our tech-obsessed culture? There's likely much more material to be mined, so help us shape what our reporting will look like. Email me, leave a message in the comments or tweet us @NPRAllTech.